Type /help into the ingame chat and it will provide you with a list of commands to help you use these features. The karts now require a level of skill to control, and each kart has different stats making some karts faster but harder to use. The normal SpeedKart is recommended for first time players, to adjust to the new handling. Physics breakouts are rare, and you will almost never get launched into nothingness. The engine sounds and horns can also be disabled, along with some other neat settings which really makes the karts more open to hosts. The superkarts have been merged into the gamemode, and adjusted to work alongside the speedkarts as if they were just more variants. Even the plane and jetski got some attention, though they look quite silly. You can enable or disable any kart from being picked. If you so wish, you can completely reverse these kart changes and force the gamemode to load the default SpeedKarts instead. In that case they load directly from the speedkart gamemode's files, so your clients would have shorter load times too. There is a /flip command that literally flips your vehicle over, which is very useful if you got your kart upsidedown somehow. Pressing your brick planting key will also spam this command, effectively allowing you to do some sik trix. Features have been ported over from my DeathMatch gamemode. You can vote to change the track, you can disable track map rotation or even make it rotate randomly instead of in order. 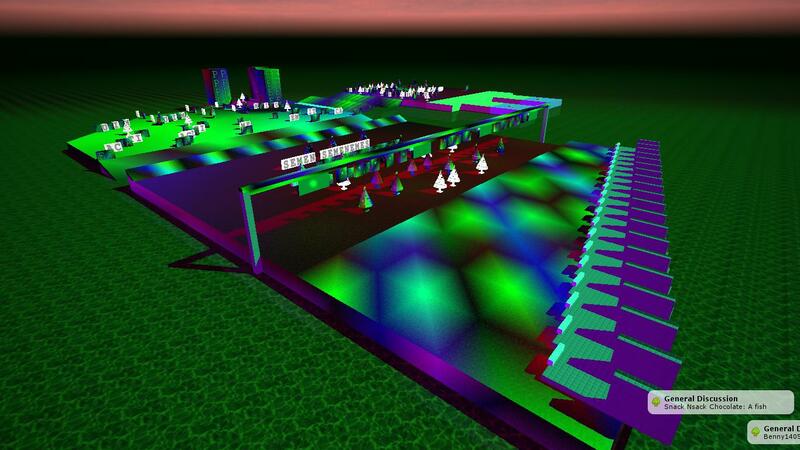 There is also a new event that lets you select any speedkart without needing to have a crazy spawn area. You can also color your kart with your paint can. Tracks can also have laps, by use of typing a number into the winRace event, this also brings you a new input event called onWinRace, which will be called for every brick once the race has been won. A bottom print has been added which displays the round, the track, the time, and your lap. Each round can have different gameplay styles. The "normal" round gives you a set of novelty items that do nothing. The "rocket" round however turns the round into a game of deathkart, allowing your players to fire rockets at each other. The "bouncy" is a nice escape from normal gameplay, allowing your players to break the maps (all in good fun) as a fast bouncy playertype. This is not recommended for "serious" servers though. My own overhauled flavor of zonebricks have been integrated into the gamemode, allowing for more complex mechanics in your tracks. This also enables tracks to have an actual working finish line, instead of requiring the player to leave their kart. Server_PGDie has been merged with the 007 death sounds bringing you some cooler death effects which should make deaths more entertaining. An achievements system has been integrated into the gamemode, providing challenges for your players. The achievements will work without any client mod. The gamemode includes commands that lets you play music from your player. You don't need to edit the gamemode to load music, you can actually load music from your custom gamemode! Everything else you need is integrated into the gamemode's code files, except for the default add-ons, which you should have already. Ingame, you can set the gamemode up to load more addons, and the NewDuplicator will be automatically detected and loaded as well. You must have at least 1 track, otherwise you're going to be racing in an endless ocean which does not change ever, which is not fun. See below for a whole bunch of maps. A 3 lap-long track which should also be fun to drive on. Based on Super Mario Kart's track. Kidalex90's joke track, now with a new spin for added playability. Rename your save file to "save.bls"
Create an enviroment.txt file containing environment variables. 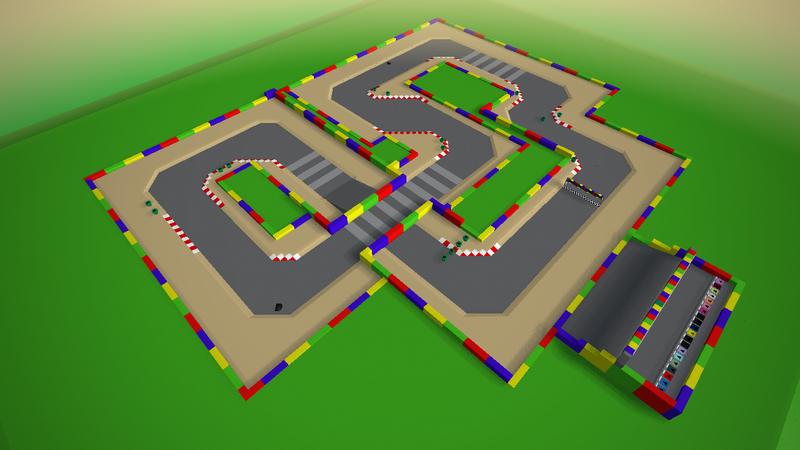 The default speedkart tracks have examples of this. Create a credits.txt and put the names of who made the save in it. Use only one line. Create a description.txt and put a short description in it. Use only one line. Speedkart didn't have this feature. Create a config.txt. Expanation is provided below. Speedkart didn't have this feature. Make a new zip file and name it "FASTKarts_My_Cool_Track.zip"
Add all the above mentioned files to the .zip you made. Start the gamemode up, disable map rotation, clear all the bricks, (you dont want to be building with public bricks) leave the minigame, load or just start building a track. The gamemode will load the newduplicator if you have it, and will also let you execute 10 more add-ons, which you can use to assist in building. Another benefit of making a track inside the gamemode itself is you can easily use the events the gamemode has, as well as all other integrated addons. Increase the WinRace event's number to increase the laps/zone enters it takes for the player to win. I don't know how it'll load if you were to just place them into your saves folder, you're meant to load these with the newduplicator via /loaddup. startingLap - Lets you set what lap players start in when the race begins. Try copying the starting area of one of the maps I've provided. All the "chips" for the track are contained within the starting sign. Also, you really should use zonebricks for the race finishes. All of the maps I've provided should be very good examples of what you should be doing. You can configure the gamemode to your liking using RTB Prefs. Choose what music you want to load through the custom gamemode. There is a /setmusic command, which /boombox, /stereo, and /music all redirect into. My chat emotes addon is also a good fit. You should be able to load it with the RTB Prefs, or you could just keep editing the gamemode.txt if you want. You are allowed, freely, and of no charge, to edit this gamemode to your liking. Use this as a base to create your own unique gamemodes. All I ask is you credit me somewhere that someone can read in-game, and to not require people to pay money for this gamemode in any way, including microtransations in servers running the gamemode. Mods should be free for everyone. Want to help me in the development of this gamemode? Feel free to suggest changes and provide your constructive criticism. Don't make it nasty. Check out the github repository. Feel free to create issues or pull requests and I'll take a look at it! Want to discuss the FASTKarts gamemode or get in direct contact with me? Join my Discord server! My only issues with the gamemode is that all the karts have the same engine sounds (which can easily become very irritating to listen to), players cannot win without their kart, and Terror Mansion doesn't have water to kill lost players. Also, would it be possible to give default vehicles blank UI names so they don't appear in the vehicle list? I may look into adding unique engine sounds for the karts. The reason why I went with superkart's engine sounds is because they're quiet. If I add more they will be made quiet as well. The problem here is that is an events issue and I'll have to edit every single map to add additional events for when a player enters the zone. However, this could be badly abused in lapped tracks, so I'm not sure if I really should go through with this. Terror Mansion doesn't have water to kill lost players. This may be fixed soon, this problem is shared with Frostjfall. I could experiment with this. We'll see what happens. Basically. It's deathmatch gamemode's systems injected into speedkart. I'm hosting this in a dedicated server with music and chat emotes if you want to check it out. I'm slightly disappointed that none of my superkart tracks were ported. Nice job on this though. I'm slightly disappointed that none of my superkart tracks were ported. I simply didn't get to them in time :) More superkart tracks will be ported to this soon, potentially Origin, Nostalgic Highway, and Archipelago. Gravity harbor, dragon waters, and aerohead jungle will probably not be ported to this as they rely too much on karts' special abilities, them being anti grav, pretending you're skiing on water, and flying, unless I manage to do some huge overhauls to them to make them play/look nice. The existing superkart ports still need a bit more work, one example is that they use way too many bricks and cause the server to lag a lot. Terror mansion might get its extra terrain details removed, like the areas outside of the track that you're not supposed to get to. It'll look more like a traditional speedkart track. Frostjall needs a lot of work as it's just simply too big and there are many instances of places you can fall down and get stuck instead of dying. - Fixed round name center print not showing. - Hud colors now change based on round type. - Hud time shows up as 0:00 if the race hasn't started yet. - The round after any rocket round will now always be a normal round. - A loading message now appears in the hud when a track is loading. - Added support for track descriptions, works exactly like in DeathMatch Gamemode. - More echos have been added to some places to help dedicated server hosts know what's going on. - A "fake" mega nuke of doom that fires empty projectiles is given to players in rocket rounds instead of the bang gun novelty item. - Every png has been compressed, saving 116KBs. - A few grammar fixes. - Integrated siba's modter bricks. - Fixed /nextRound command bypassing disabled track rotation. - Touched up some superkart ports and ported Origin. Another update is already planned, while porting origin to this I realised that some tracks might have their win race zone placed right after the starting area in a lapped track, as I've done this with origin. I cheated by making it a 3 lapped track which will result in players going through the track twice like in the other superkart tracks. I'll probably add the config.txt feature over from DeathMatch and add a starting laps option, which would be set to 0 in cases like this. Also, I am hosting this. Look for "piber20's THE GREAT KART FASTING". Even though I am agaisnt mixing up speed and superkart on the same Gamemode, I appreciate the effort that has been gone into this.